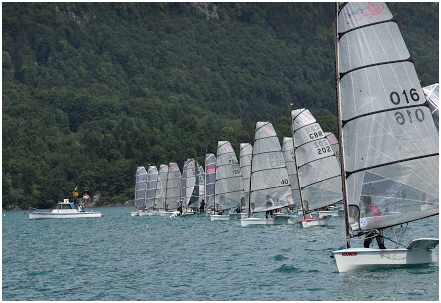 The 2018 D One Gold Cup hosted by Union Yacht Club, Wolfgangsee, saw a record entry of 43 boats from 9 nations. 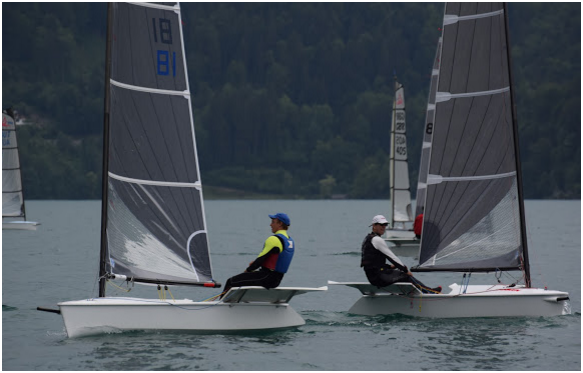 Based in the picturesque Austrian town of St Gilgen the championship saw challenging conditions and a competitive fleet including Nick Craig, champion in multiple classes and a 3 times Gold Cup winner; Viktor Teply, Czech 2- time Olympian in the Laser class, Ondrej Teply, a previous winner of the Finn Junior Worlds and 5-time Olympian / 6 time winner of the Finn World Masters Championships, Michael Maier. Day one saw tricky conditions with the first race which was led by Tim Garvin being abandoned due to a thunder storm warning. The experience of the race team showed as they quickly re-set the course and managed to run 2 races. Viktor scored 2 bullets with Nick 2nd and Giles Chipperfield showing good form with a 3rd and a 6th. Day 2 saw more good race management as the RO anticipated the thermal wind and set up the race course perfectly. 3 races were completed with Nick picking up 2 wins and a second to move into the lead. Day three saw 2 races sailed in a shifting wind with changing pressure across the course. This saw several changes on the leader board. However Nick delivered a strong performance in the conditions taking 2 more bullets. Victor and Giles consolidated 2nd and 3rd places. 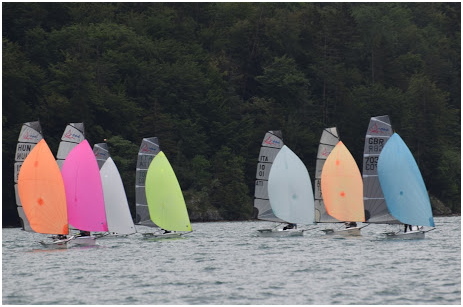 The final race on Sunday saw the fleet out in the afternoon thermal with Nick once again demonstrating his mastery of the conditions with a clear win over Chris Sallis who finished 2nd and Michael Maier rounding out the top 3. The final results saw Nick taking the title ahead of Viktor and Giles, with Giles taking the Masters title ahead of Michael Maier and Chris Sallis. Devoti Sailing and Harken both generously provided prizes which were spread throughout the competitors. Union Yacht Club and the Austrian D One fleet, in particular Felix Hofinger and Georg Schofegger, did an excellent job of organising the event with social events every evening and a good supply of free beer sponsored by club members! The ethos of the D One class is to travel to new and interesting places, meet with old friends and make new ones whilst enjoying competitive, exciting sailing and great social events and this event certainly lived up to that. With the largest championship fleet to date everybody enjoyed battles on the water and sharing a beer or two afterwards. The UK fleet now has the Nationals at Lymington early in July before heading to one of our favourite venues Santa Margherita Ligure in Italy for the European champions ships in September. With growing fleets across Europe the class has outlined the international championship programme for the next 2 years with the Gold Cup in France and the Europeans in Switzerland in 2019 and Europeans in Northern Spain and the the Gold Cup coming to the UK in 2020.